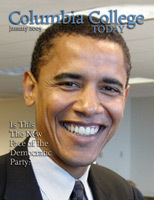 The New Face of the Democratic Party? Barack Obama ’83 delivered a rousing keynote address at the Democratic National Convention, received 70 percent of the vote in the Illinois senatorial race and this month became the only African American in the U.S. Senate. Alumni and friends gathered in November to honor Robert K. Kraft ’63. Political cartoonist R.J. Matson ’85 shared his work with the CU community through Spectator and now reaches a broader audience. Bob Rosencrans ’49 saw a future in cable and changed the way we watch TV.